Excel London and Visit London hosted almost 15,000 delegates at the capital's largest medical convention. 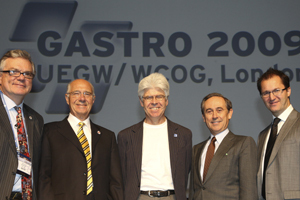 The Gastro 2009 UEGW/WCOG event attracted gastroenterology experts and practitioners from across the globe and is thought to have brought more than £30m to the London economy. Excel London director of conferences and events James Rees said: "We've now delivered the largest ever international medical convention to come to the city; we hosted the world's most high profile meeting in the London Summit (G20), and have recently launched London's first International Convention Centre." Visit London director of business tourism Tracy Halliwell added: "The delivery was a concerted effort from the City of London, Visit London and Excel London. London is now truly competing in every aspect of meetings and events. We have the product and the brand to bring in any kind of event here and the expertise to deliver it."